v Horizontal Toggled Type Injection Molding Machine (20 ton to 300 ton Capacity). v Vertical Screw Type Injection Molding Machines (75 gm to 2 kg Capacity). v Superior Quality & Technology. 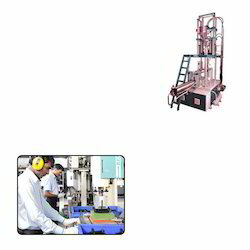 We are manufacturer and supplier of a wide range of Molding Machines for Plastic Molding. Our products are known for durability and sturdy construction. Our machine design has a simple, robust and attractive, heavy duty integrated casted platen.